Nikki Boyd isn’t usually called in on homicides; her forte is missing persons. But when a case with two murdered and two missing pops up on a quiet suburban street, she’s ready to start the investigation and find missing homeowners Mac and Lucy Hudson. When the first clues lead her to the boat of her friend Tyler Grant–and another dead body–Nikki must untangle what ties Tyler to the Hudsons. The clues pull her into a deadly maze of counterfeit drugs and a killer who will stop at nothing to silence anyone who threatens his business–including Nikki. 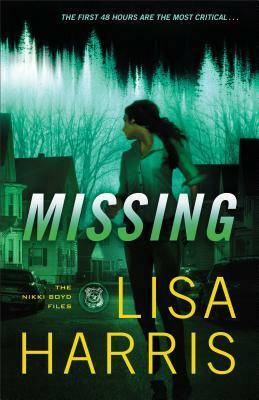 Rich in characterization and content, Missing is an exciting romantic suspense! Although I have not read the first book in the Nikki Boyd Files, I had no trouble following the storyline. I loved the twists and turns of Nikki’s fast-paced pursuit of a missing woman, compromised pharmaceuticals, and a gang of killers. These threads, intricately woven through the narrative, kept me hurriedly turning the pages to discover what would happen next. I also delighted in Nikki and Tyler’s relationship and look forward to reading Vendetta to learn how their story began and Pursued (Spring 2017) to see where their journey leads.